As America turns increasingly gray, the aches and pains of osteoarthritis are increasingly a concern for baby boomers. An article in Medscape Rheumatology, a part of the WebMD professional network, says more people are looking to CAM, complimentary and alternative medicine, for relief. Depending on the severity of the condition, the usual approach to arthritis commonly involves over-the-counter and prescription medications. They can have side effects that can range from a nuisance to serious. The article confirms that there's a steady growth in CAM among 50 million arthritis sufferers, a number that's bound to grow as boomer get older. Chiropractic medicine --A debate still perks on the benefit of chiropractic treatment. But increasingly, even medical doctors are siding with chiropractors, saying they have a place in medical care options, especially considering chiropractic's focus on joint pain, endurance and muscle tone. 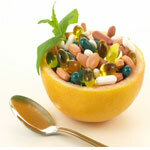 It serves especially for people who want to avoid medications. Glucosamine sulfate/chondroitin sulfate -- While the National Institutes of Health's GAIT trial said the supplement wasn't helpful, experts in the Medscape article noted the trail focused on the benefits for severe pain to moderate pain. However, the trail didn't address mild to moderate pain, other than noting that for people with mild to moderate osteoarthritis pain, it was better than placebo. In fact, the physicians in the article said they use glucosamine/chondroitin and that they've gotten relief. Anti-inflammatory herbs --"The beneficial effects of anti-inflammatory herbs and supplements have been demonstrated in multiple studies," the article says. "Although these effects appear to be relatively modest, they seem to be effective." Yoga --The "body/mind experience" is an excellent alternative, says the article, especially when it complements vigorous exercise. The focus on flexibility, stretching, breathing and meditation -- which triggers endorphin release -- can have a beneficial effect on arthritis pain. Acupuncture --Studies show mixed results of the effectiveness, but the adherents are growing in numbers -- including physicians who are incorporating acupuncture into their practices. "In the hands of a skilled practitioner, acupuncture appears to be less toxic than the pharmaceutical alternative," the article says. "Acupuncture has been shown to stimulate the release of endorphins into cerebrospinal fluid. Thus, this traditional Chinese therapy triggers analgesia by a mechanism that has been validated using the scientific method." Diet --The article touched on diet, but noted generally that the food choices by people seeking arthritis relief tended to be the same as those for general heart-healthy eating and weight control, as in more fruits and vegetables, omega 3 fats, and so forth.